I promised the RvB killboard analysis and now I received the Blue Republic 2013 data (predates GRR Project). You can download it for your own checks, the header is "Code Time Place Value Target Blue_part Red_part". 153124 kill reports with 2.72T total value, both matching the zkillboard statistics page. 12358 kills discarded for not being API verified (negative code). This leaves 2.39T total kill value. Blue Republic made 1.49T contribution, 60% whoring ratio isn't bad. 0.3T damage was done by Red Federation on these kills (obviously, these are not all Red kills, just where they co-killed with Blue). So, who did Blue kill in 2013? First being Red is obvious. Second being itself is obvious too, due to free for all events. But look! Who was the third target, getting ahead of "large wars" like BNI, E-UNI? The Marmite Collective. Remember that it's only Blue, there is no reason to believe that Red performed any worse. Also don't forget that Marmite was at war with RvB for only a few weeks (exact number can't be told as they were mostly allies and there is no way to determine how many weeks were they allies in a long war). Anyway that #3 position speaks for itself: RvB was targeting Marmite in 2013, despite there was no GRR project and Marmite wasn't involved in POCO wars in 2013. How did they get into war? By RvB joining as allies to Goonswarm. Speaking of GSF, RvB roams indeed did damage to GSF, 5.5B, which isn't much more than they did to TEST and 1/6 as much than they did to Marmite, despite Goons are presenting 40x more targets. The whoring multiplier on GSF and other CFC targets is very high, meaning that they did it in large mixed fleets (which would probably kill the Goon if RvB wasn't there), while the Marmite kills were done by themselves. I'm not sure how much more evidence I have to dig up to prove that RvB is merely a tool for GSF to defend its interests in highsec. Whenever a highsec wardeccer becomes a problem to Goons, RvB joins in and ruins their killboard, which is precious to most highsec PvP-ers. This is a strong deterrent for them to mess with Goons. 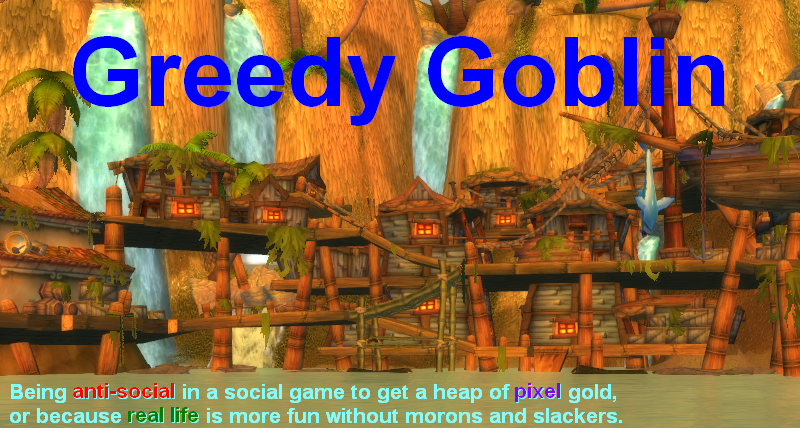 The Red versus Blue and free for all fights are only there to keep the PvP-ers well fed with newbie kills to prevent them from leaving in boredom into PvP corps that would attack Goons. We've seen that in February RvB caused 20.9B damage to Lemmings and 16.9B to Marmites. Assuming Blue did half of it, during a year this would be 125B to Lemmings and 101B to Marmite. In 2013, Blue did 386B non-RvB damage. This is why I believe that RvB is already exceeding its combat capacities. Please notice that the ships they kill in FFA events cost 4M, the Red ships they kill cost 12M, so they indeed fly as cheap as possible. Fun fact: despite we reinforced more POCOs, RvB let the war lapse, clearly because they couldn't keep it up. We'll see when the Goons order them back to do what they were made for. PS2: I've deleted 100+ comments telling that what I'm doing is irrelevant and the Goons can't care less. You can see 100+ similar ones on the EN24 repost of my February report. I can't tell if it's a DOS attack or just them being MAAAD! Put up a chart of all the high-sec wardecs CONDI received in 2013. Then put up another one showing all the times RvB has entered that conflict as allies - or entered into their own 'independent' wardec of that same target in reasonably short order. Do that, and you'll have something more convincing than relatively weak correlation. @Anonymous: what I want from RvB is irrelevant. My posts or my actions towards them has zero effect on their decisions. Their decisions depend on one and only one thing: what the Goon directorate tells them. The logic flaw you make is assuming there are 40x goons to show for rvb. Remember we're talking about hisec, where both marmite and rvb live and goons do not. I think most of the random smaller values in the list comes from RvB Ganked roams. That's why there were a lot of random people on the kill mails. Its a public roam so these fleets are quite mixed. Nevertheless the Ganked roams did more then a trillion isk damage to random people in the last 2 years. This number must have an influence on the killboard statistics, since a lot of RvB veterans fly with this roam every week. Gevlon: Yeah, I read that post when it went up. It doesn't present the data I said you'd need to, and what data it does undermines your conclusions. A)You need to show how quickly RvB enters those wars. B)Show which of those wars RvB was drawn into as 'War Allies' vs. directly entering a wardec of their own (which could be coincidence) + which ones they themselves were wardec'd into by the party attacking CONDI. C)Your data would clearly seem to indicate that of 130 wars declared on CONDI, RvB participated in 12. That's less than 10%, which is clearly at odds with the idea that RvB is actively defending CONDI. I understand why you'd point out that they account for 66% of all Goon losses - it certainly would be suggestive that when Goons are taking damage, they call in RvB... on the surface. First, you have to account for the fact that at least 3 of those wars are, in fact, the same war: You v Goons (Marmite v Goons, Marmite v Goons, and Lemmings v Goons). So now we're at 10 wars out of 127, or RvB only joining in 7.87% of the time. That doesn't go directly toward the percentage of losses, but humor me for a moment. Next, we have to account for the fact that your own efforts skew the data. Specifically, if you're looking for a larger trend - ie: beyond the Marmite/Lemmings data, then you have to analyze the data without the Marmite/Lemmings war's effect on the numbers - we're taking it as a given that RvB has entered into the Marmite/Lemmings war, after all. So if we exclude that, we come up to 7.94% incidence of RvB jumping into a war against someone who's already fighting Goons. Ok, marginally better for you when it comes to demonstrating that they do so 'often', but still doesn't rise to the level of being more than opportunistic background noise. But an interesting thing happens to that 66% of the Goons' losses if we remove the Marmite/Lemmings war: it drops. 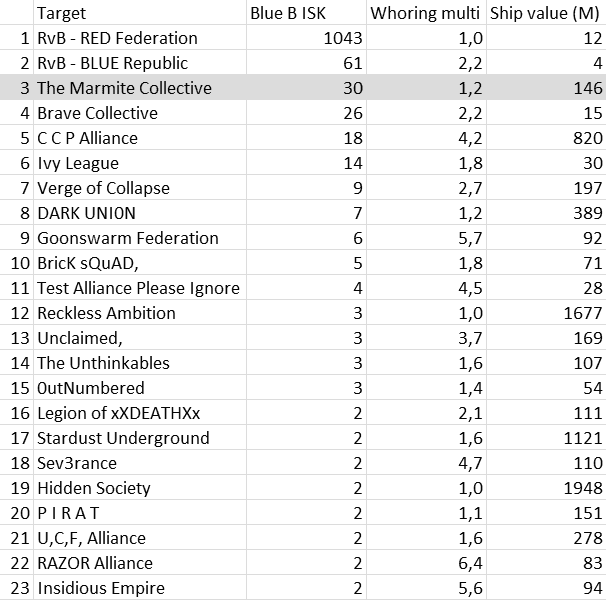 In the non-Marmite wars where RvB has entered, the Goons lost 16.3b ISK, out of a total of 252.4b ISK lost in non-Marmite wars, for a total of 9.5%. Not only is this well within that same range of 'background noise', it's not even a single standard deviation from the 7.94% of the wars RvB chose to get involved in. In short, RvB's entry into the war had, from a statistical point of view, no real, measurable effect. They might as well not have been there. This is hardly the performance one expects of someone 'protecting Goon assets' - if anything, Goon losses should be markedly lower where RvB has entered to protect them, or else why continue to make use of them in that manner? The Mittani is not known as someone who continues to throw money or time at bad investments. Which is why I say, to the extent that your data actually affects your point, it argues against your conclusions, instead of supporting them. >First, you have to account for the fact that at least 3 of those wars are, in fact, the same war: You v Goons (Marmite v Goons, Marmite v Goons, and Lemmings v Goons). The data is from 2013. There were no Lemmings/POCO wars in 2013.
this data is 2013 but the data Arrendis is talking about included lemmings wars. The war breakdown treats each instance of a war as part of the POCO treaty, ranging from late 2013 to present, as a separate war, when they are all really the same thing. Your thesis is that RvB was created to protect "goon assets" in highsec. Could you please outline what assets you mean, because before highsec pocos were a thing, there were no highsec assets that goon leadership wanted to protect. Moving the goalposts again there, Gevlon. You say the numbers indicate RvB is protecting Goons, even touting the fact that RvB's been involved in the wars involving 66% of the Goons' losses. Then, when you're shown that the numbers' indication can most definitely be disputed - you switch back to claiming the asset in danger is the Goons' sense of superiority. Goons mock one another for being stupid all the time, man. Most of the killboard work you've shown has been ganking solo travelers - and the goons will tell you straight up that getting caught means you were stupid. Want to put a ratting ship together? Buy the parts and ship it out. Don't fly it out, you're just asking to die. In fact, don't go to highsec on the CFC characters - it's just asking to get shot at when you're doing something else. Stick to the numbers - you've demonstrated that you really don't have a firm grasp on how the line Goon approaches the game, much less the organization elements of Waffe, CONDI and the CFC. In 2013, most of the non-POCO RvB/ Marmite action was Marmite deccing RvB looking for easy kills in Jita, not RvB deccing Marmite. For me it doesn't matter much about the history of RvB being a goon pet alliance but the fact is they now defend the goons assets. No matter how good a spin you try to put on it RvB have been made goon slaves by their leadership and deserve no more respect than you would give the goons. Frankly, I give the Goons plenty of respect - I fly with them, I run the logistics in their fleets, and I do work behind the scenes, from time to time. That doesn't stop me from being able to honestly appraise them, though. They're certainly not perfect, and they're not gods among men in New Eden. That said, I think you and Gevlon both are highly off the mark in your characterization of the CONDI/RvB relationship. If anything, RvB is using Goons. First off, there's a deal in place. That deal is voluntary, and was entered into freely by all parties. That deal does not involve RvB taking orders from Goons. RvB's fleets don't seem to be coordinating with Goon fleets at all - and that's caused some consternation on the CFC side. If RvB were 'pets' or 'slaves', that issue would be rectified, quickly. That it hasn't been is either a massive hole in the 'RvB serve Goons' narrative, or an indication that Goons are more concerned with protecting RvB's reputation than they are with their own revenue streams, which is silly. Second, let's ask ourselves the age-old question: qui prodest? Who benefits? RvB is 'protecting' Goon POCOs, that's the narrative. Those POCOs have to be making mad money for CONDI, right? Honestly, I'd have to sincerely doubt that. Compared to CONDI's normal operating budget, a handful of POCOs in what, 3-4 systems? That's chump change, as demonstrated by the fact that the CFC hasn't made any concerted efforts to put real force into protecting them. There've been no fleets with real logistics and ewar capabilities, no coordinated use of significant numbers of fast tackle to hold Marmite's aggressor groups in place. What RvB gains from their treaty, however, is a good deal more quantifiable. Beyond simply gaining an avenue for the PvP action they seek, RvB was able to secure a larger segment of the highsec POCOs in the Forge than they might otherwise have managed, in part due to CONDI's commitment not to compete with them for many of those facilities. Given the relative sizes of those entities, the revenue stream from highsec POCOs is almost certainly far more valuable to RvB than it is to CONDI. And yet, this war is not touching that revenue stream at all. Right now, the war is threatening to minorly effect the revenue stream of CONDI, and costing RvB... what, exactly? Yes, I've seen Gevlon's numbers, but at the same time, consider this: from RvB's perspective (indeed, from the perspective of pretty much every PvPer in New Eden), combat ships are ships you're already willing to lose. The simple fact that RvB continues to lose them means that Gevlon's efforts haven't actually borne any fruit yet. He's not actually hurting them, or they wouldn't keep showing up. So if RvB isn't taking losses they consider excessive or painful, and they're showing a demonstrable benefit from an arrangement that nets the Goons at best a trivial amount of additional isk for the sake of diversification... who's using whom? How can RvB said to be a 'pet' or a 'slave', if they're the ones making out on the deal? If that's the case, then most groups are slaves of goons, since most groups at some poitn have made a deal with goons. RVB have a deal with goons that they profit from. That's all. Theyve had deals with other groups before, and other group have had deals with each other. Think about why you suddenly think this particular deal makes them slaves, while all other deals made in the history of eve havent evoked that response. The reason is that you have an irrational emotional response to the situation clouded by hatred of goons.